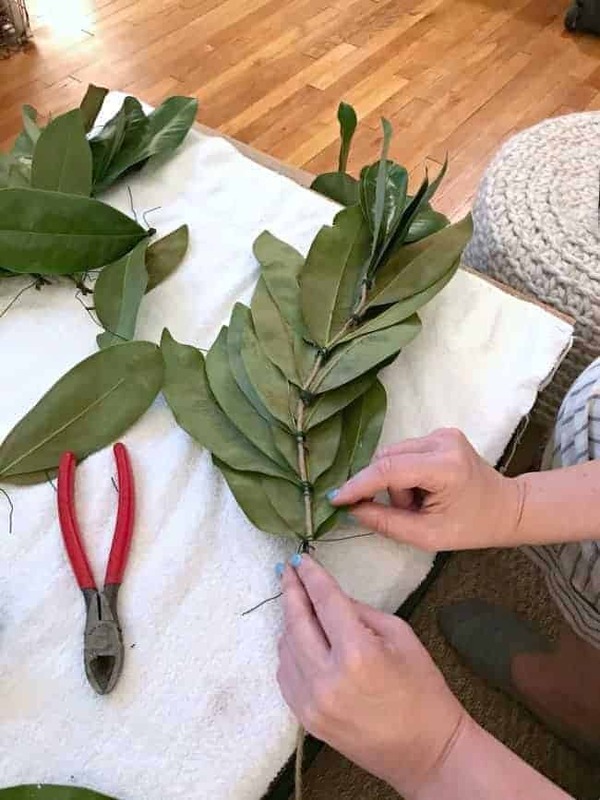 How to make a beautiful DIY magnolia leaf garland to hang in your home for the Christmas holiday. Are you ready for Christmas yet? I have to confess that all of my decor is up and my first handmade Christmas decor is complete, a magnolia leaf garland that I made for our big kitchen window. This window is one of the reasons why I love our little cottage so much. It lets so much light in and the view of the woods next to the house is beautiful. There’s nothing like it. I think we appreciate it so much because we had 2 small windows in our Illinois kitchen. Not only did they face North but they also looked out onto our neighbors back door, that was about 25 feet from our house. They were nice enough neighbors but they could sit on their deck and see everything we were doing. Needless to say we always had the windows covered. This year I wanted to use a garland again but I wanted to try magnolia leaves. I’ve used them in my decor before and they always dry beautifully, so you can keep them a bit longer. I looked online and the prices for a magnolia leaf garland were way more than I was willing to spend. Our window is 8 foot long so we need something that’s about 13 feet in length. Eeek…that equals a lot of money. Not giving up on my plan (because those words aren’t in my vocabulary), I started looking into making my own. I don’t have a magnolia tree in my yard but I do have plenty of neighbors that have them and they were very generous. Even if you don’t have a generous neighbor with a magnolia tree, you can find them online. 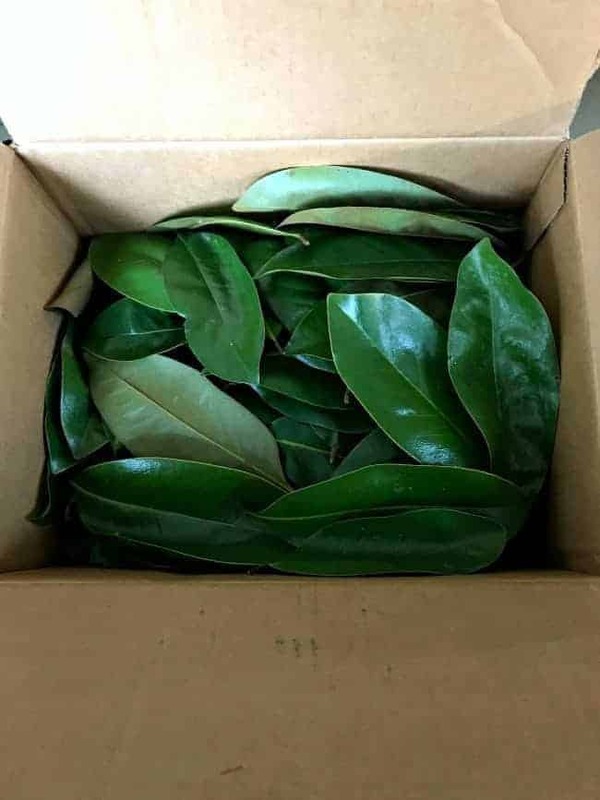 Yup, you can even buy a box of fresh magnolia leaves on the internet. You can get a box of around 350 for right around $50 (I checked). 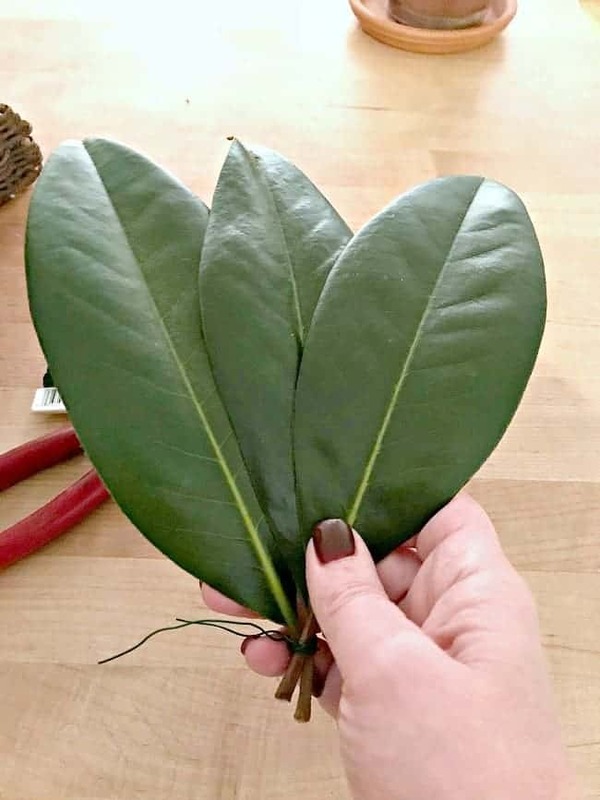 I’ve never done this kind of craft before but figured out a plan and, as soon as they were picked, the hubs and I set to work wrapping the magnolia leaves. This was really easy to do but it did take some time. We ended up spending about 2 hours, over the course of 2 evenings, to make our garland. 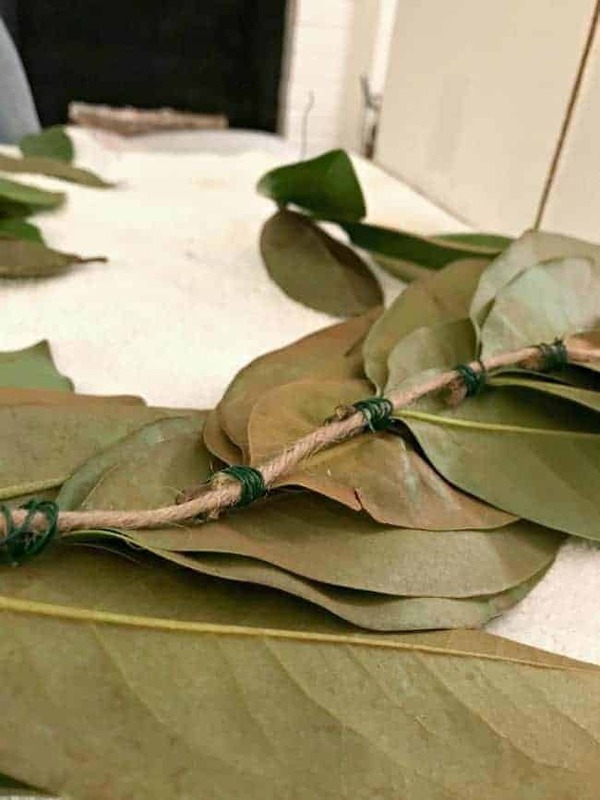 We started out by wrapping 3 leaves together using floral wire. Once we got a good pile going, hubs continued wrapping while I started attaching each trio to the covered craft wire. There was no measuring involved. I just started attaching them so that the stems all faced one way, about 1 1/2″ apart. The goal was to hide the stems and wire. You’ll notice too that this is a flat garland. Meaning that there is only one pretty side. I would have loved to do both sides but it would have been difficult to hang it in the window (and the hubs would have killed me 😉 ). I didn’t wear gloves to do this but I recommend them, if you can. The floral wire really did a number on my fingers. A little tip about the natural covered craft wire I used. Hubs wanted me to use cotton string we already had but, with that big expanse and the weight of the leaves, it probably would have stretched and drooped. I thought it would be wiser to use the covered wire and I was really glad that we did. It was really easy to use and there’s no worry about it drooping. I would have liked it to be a bit fuller but I love how it turned out (and that it was free). Maybe next time I’ll put my trios closer together and experiment with using the top and underside of the leaves. They’ve already started to dry and turn color. That’s what I love most about magnolia leaves. And, because I love magnolia leaves so much, I crafted my own magnolia leaf wreath for our front door (and there’s a video). Don’t miss our holiday home tour – Christmas dining room. I went in a different direction with our holiday decor this year and I’m really loving the change. Oh, and I also crafted some easy DIY dried orange slice ornaments if you want to check that out. How long did the wreath last? I’m thinking of making a bunch for my wedding, and were trying to see when we need to start making them. Hi Kayla! I made my wreath in December and it did dry out but it’s still very pretty. It should last quite a while (I plan on using it again next year). Hope this helps. Congrats on your wedding! That looks wonderful and really suits your kitchen . Congrats to both of you! Thanks so much, I appreciate it! We really love the way it turned out. Your garland looks fantastic! You make it look like anyone could make one and it really does look great on your window. I’ve used real Christmas garlands in the past and not only don’t they last, but the needles end up everywhere. Pinned. Visiting from Blogging 50. Thanks so much Carol! This really was easy to do and I’m thrilled with the way it turned out. I had a garland that shed needles last year so that is why I went with magnolia leaves this year. I want to make a few adjustments but will probably do it again next year. This is a beautiful garland. You did a great job. It looks pretty easy to do. I love how the leaves turn brown. Do you think it will keep from year to year? Looking forward to your holiday house tour! Thanks so much Julie! It was really easy to do, just took some time. I’m not sure this one will keep past this year but I did have a wreath once that lasted quite a while. Kristi, what a beautiful garland, and I know you are enjoying having something natural at your window! It looks plenty full to me. Don’t we wish the natural elements would last a bit longer! It’s so festive looking! Pinned. Visiting from BF group. I appreciate you stopping by and pinning. Happy Thanksgiving! This is so pretty, Kristi! You are a very patient crafter. Now I wish I had a magnolia tree! Kristi, love the garland! Boy, what I job! You have more ambition then I do. I love your kitchen. It is very bright and cheery. I have about a half acre of woods to look out on. When we bought our house we had two small windows and a back door facing the woods. 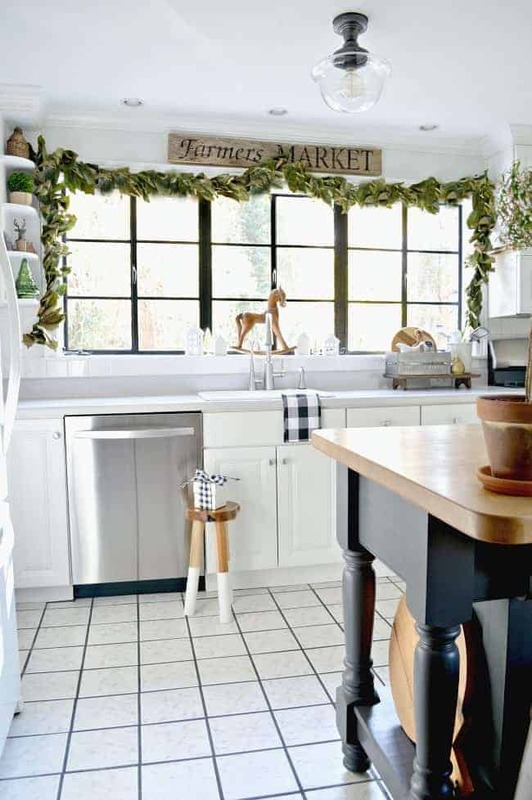 We eventually added an attached garage and move the entry to yard with a sliding Frenchwood door in our dining room and added a bay window area to our kitchen. Now everyone can sit at the kitchen table and look out at our woods and all our woodland creatures. Thanks so much MJ! I don’t like all aspects of holiday decorating but the window is a fun thing to do. It sounds like you have a beautiful view from your kitchen as well. It’s something that I never take for granted. I think your garland looks spectacular! 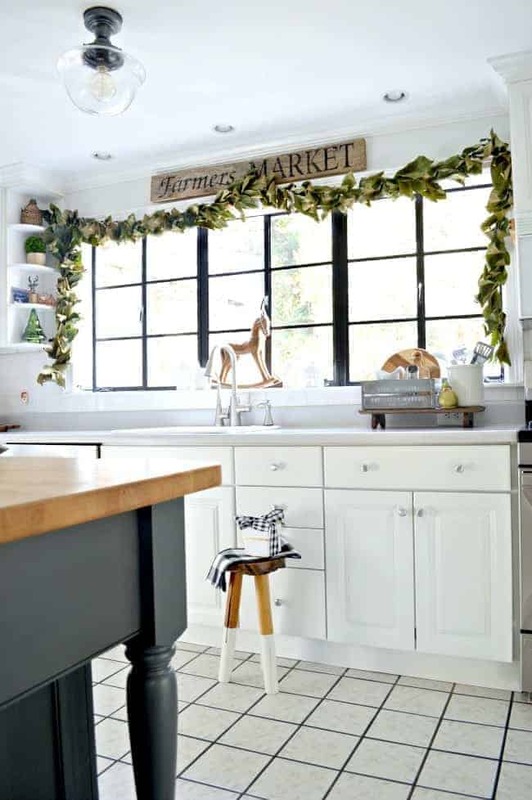 I always have window envy when I see your kitchen window, and the magnolia garland is the perfect holiday dressing for it! WOW, love the garland! You do nice work and have a lot of patience. I haven’t started decorating yet because here in Florida it is still 80 degrees and it doesn’t seem like the holidays yet. You are so sweet, thanks Brenda! I actually enjoyed doing this project. 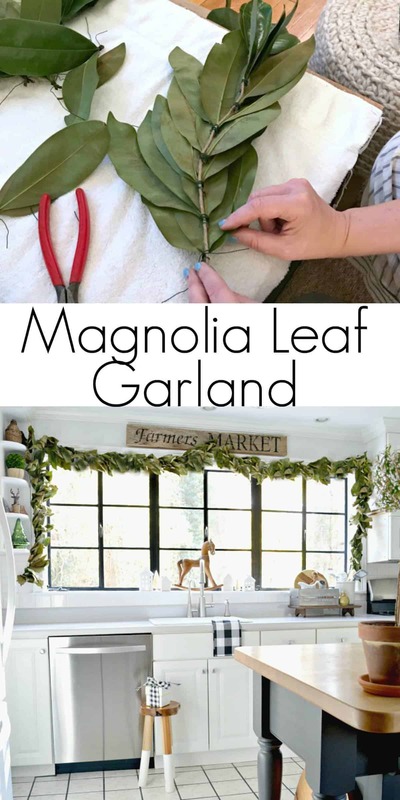 Your magnolia garland looks beautiful! You did an awesome job. Thanks for the tutorial! Thanks so much, Cynthia, I appreciate it! I love your garland you made, and i too think they are so beautiful. I am surprised at where you found your leaves. Have a great week and a Happy Thanksgiving. Thanks so much, Marlene, I appreciate it. I think you can find most anything on Etsy nowadays. It’s my go-to for so many things. Happy Tuesday and I hope you have a Happy Thanksgiving. Wow, you deserve a creative crafters medal! Nice job, love your holiday window…already loved the window anyway. Thanks so much, Jillian. 🙂 I don’t consider myself a crafter (or should I say a good crafter), so I really appreciate your comment. I do love how it frames the window. I never really saw magnolia anything until we moved South. A couple of years ago I found a huge magnolia wreath in a floral supply (in Chicago) and it was gorgeous. It kind of reignited my love for it. Love it. Always a plus to add natural elliments. I noticed in the pictures that you have two different horses. I also love the cut shelf that sits on the counter. Can’t wait to see more. Thanks so much for stopping in Rose, and for your sweet comment. Thanks so much, Laura. It took us about 2 hours to make the whole thing. It’s not a quick project but it wasn’t bad. Beautiful! I can get the magnolia leaves free, so there’s no excuse for me not to try this myself, right? Thanks for the detailed tutorial! That’s right, Kim. 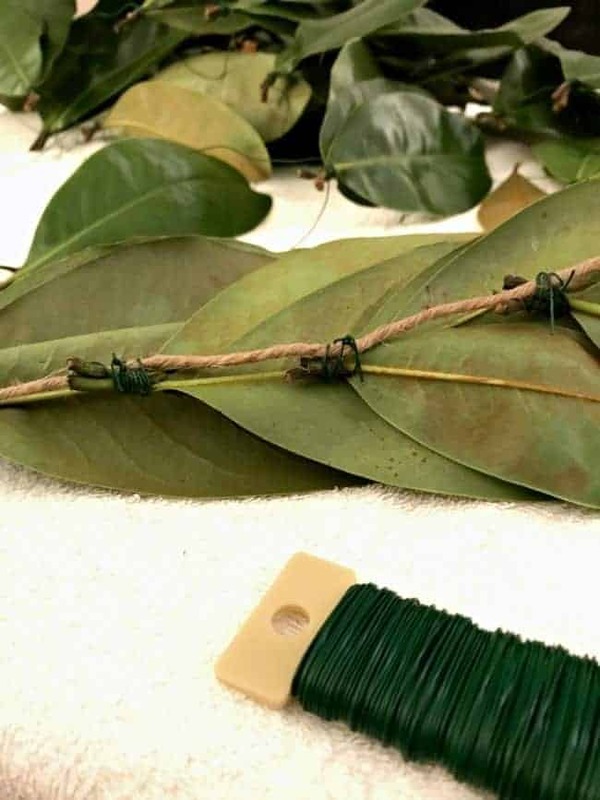 Free magnolia leaves equals many homemade garlands. Woot! 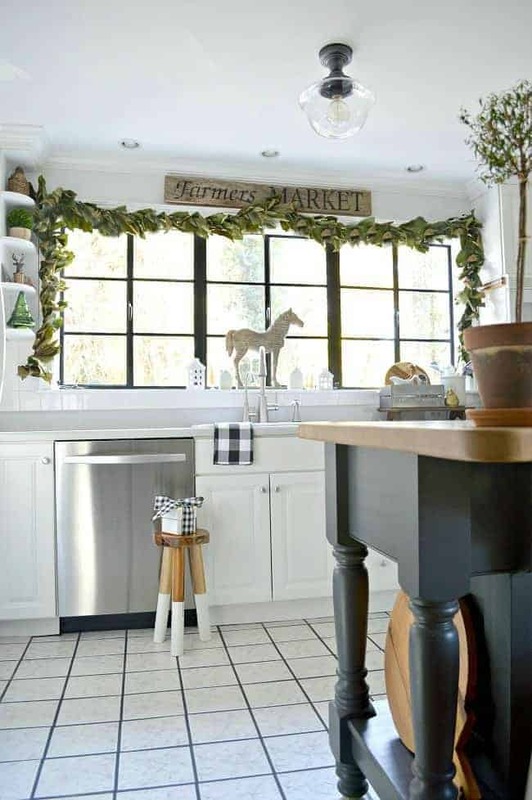 That window is stunning and your beautiful garland is the perfect accent! Thanks so much, Roxanne. I’m so happy with the way it turned out. What a gorgeous garland! Thats quite a bit of work involved and it is a piece of art work! I think it pretty full and it look perfect! Lovely cottage and love the windows.